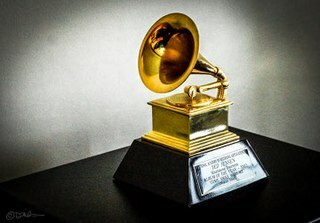 The Grammy Award for Best Jazz Vocal Performance, Duo or Group was presented from 1981 to 1990. The Grammy Award for Best Jazz Vocal Album is an award presented at the Grammy Awards, a ceremony that was established in 1958 and originally called the Gramophone Awards, to recording artists for quality works in the vocal jazz music genre. Awards in several categories are presented at the ceremony annually by the National Academy of Recording Arts and Sciences of the United States to "honor artistic achievement, technical proficiency and overall excellence in the recording industry, without regard to album sales or chart position". Kacey Lee Musgraves is an American singer and songwriter. She has won six Grammy Awards, four Country Music Association Awards and an Academy of Country Music Award. Musgraves self-released three albums before appearing on the fifth season of the USA Network's singing competition Nashville Star in 2007, where she placed seventh. In 2008, Kacey recorded two singles for Triple Pop in Austin, Texas. Drew Pearson is a Grammy-nominated American songwriter, producer, and multi-instrumentalist. He has written and produced for artists such as Kesha, Galantis, Kygo, Ansel Elgort, Michelle Branch, Lights, and more. ↑ "Mecca for Moderns". AllMusic. Retrieved 10 March 2017. ↑ "Sharky's Machine". AllMusic. Retrieved 10 March 2017. ↑ "Bodies and Souls". AllMusic. Retrieved 10 March 2017. ↑ "Vocalese". AllMusic. Retrieved 10 March 2017. ↑ "Free Fall". AllMusic. Retrieved 10 March 2017. ↑ "Take 6". AllMusic. Retrieved 10 March 2017. ↑ "In a Sentimental Mood". AllMusic. Retrieved 10 March 2017.